The Draft Horse Show Comes to Greater Lansing...and it's BIG! The Draft Horse Show Comes to Greater Lansing...and it&apos;s BIG! Okay, I knowyou&apos;veheard of a Bud Light draft, and then there are the Hey! Close the back door! drafts, but have you ever witnessed the power and majesty of the one-ton Big Boy draft horses?! 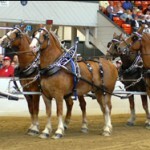 Here in East Lansing, October 18-21, is the Michigan Great Lakes International Draft Horse Show and Pull. Held at the MSU Pavilion on the corner of Mt. Hope and Farm Lane, its the biggest event of its kind in North America. These giant horses are Belgians, Clydesdales (yes, think Budweiser), Shires and Percherons that weigh over a ton. Yup, Im talking big horses with big equipment. You know what I mean. Big hitches, big plows. Am I saying big a lot? Its hard not to. 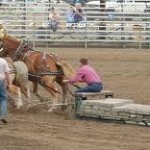 Come out and watch them compete in hitching, plowing and pulling classes. You can check out the schedule on the website www.mgli.org. Visit the plowing matches outdoors on the east side of the pavilion, and then go inside to see the light and heavyweight pulling contests, the commercial exhibits and to learn even more about each particular breed. It is truly a sight to behold and fun for the entire family. So Im inviting you to come out and see over 1,200 big draft horses from all over the US and Canada. Right here in East Lansing. Im telling you, Its BIG!